Kittens are born with their eyes firmly sealed. They are designed that way as nature’s method of protecting their eyes from infection and eye damage during birth. Their eyes slowly begin to open anytime between 2 to 16 days of age. Each kitten in the litter will open their eyes at different times. Once a kitten’s eyes open they may not be able to see clearly as their vision is still developing. At this stage, they depend on their other senses of smell, touch and their mother. The kitten’s eyes are completely open by the time they are 3 weeks old. But their vision will continue to develop over a period of several months. If their eyes are clear and not red or pink or have discharge, their vision is completely fine. At about 2 weeks of age, kittens open their eyes and they are a beautiful shade of blue. Over the next few months their eye colour will change to the colour that they will have throughout their adult life. Most of the adult cat’s eye colours are in the colour continuum from green to yellow and yellow to orange and to copper. Breeds like the Siamese and Tonkinese have blue eyes. During the transition period where a kitten’s eyes change from blue to a permanent eye colour, you will see flecks of different colours. The colour flecks are from the pigment cells, known as melanocytes, in the iris. Just as in the case with humans’, a cat’s eyes colour is determined by genetics. 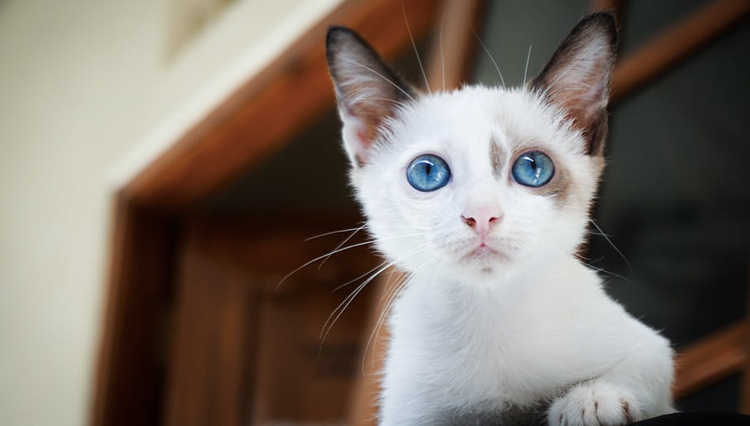 Breeds like the Siamese will have blue eyes permanently and it is alright if they do not change colour. If a cat’s eyes are shiny and appear healthy then they can see very well. It’s just that their eye colour was blue which can slowly change to a permanent colour or remain the same according to their genetic code. Their eyesight matures completely by the time they are weaned, that is by 8 weeks of age. Few cat breeds take close to three months to transition to a permanent eye colour and take about a year for their eyes to darken and mature to a permanent eye colour and hue. A cat’s eye colour never changes once their vision is completely developed and matured. If their eye colour changes then it is a sure sign that they need medical attention. The coloured area around the pupil is the iris and the cornea are the clear region in front of the eye that you see through. So, a blue iris is completely normal but a blue cornea is not. A serious eye infection can make the cornea appear blue. If you notice this in your pet you must take them to the vet and have them thoroughly checked. A healthy kitten’s eyes must be clear and bright. Signs of an eye infection are scratched eye from play or injury, eye swelling, discharge, cloudiness, continuous blinking, squinting and watery eyes. Conjunctivitis is a highly contagious eye infection seen in cats. The most obvious sign of it is watery eyes. The cat may squint and have dark tear stains on their coat. It is easily treatable with prompt medical attention. Uveitis is another common eye infection seen in cats. The uvea of the eye is the part that includes the iris, the ciliary body that is behind the iris and the choroid which is the middle of the eyeball consisting of blood vessels. When either one or more of these parts get inflamed it causes uveitis. Signs of uveitis include eye redness, eye discharge, cloudiness and change of eye colour. If the disease is caught in the earliest stage treatment is easier. It requires swift medical intervention. So, if you notice any changes in the eyes of your kitten it is a good idea to get them checked by the vet. By doing so you will be helping your kitten lead a long and healthy life!